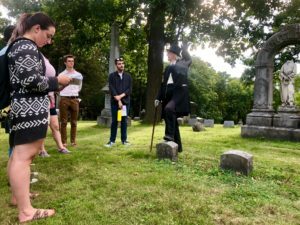 On Thursday, September 20, 2018, director of the Magazine, Newspaper, and Online Journalism department, Melissa Chessher took a group of Honors students to Oakwood Cemetery. 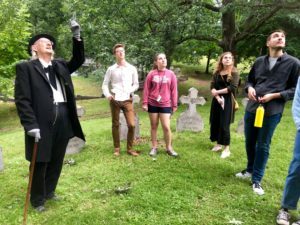 Sue Greenhagen, a member of the Historic Oakwood Preservation Association, conducted the tour, entitled “Live Oaks and Dead Folks” in character and full-costume as a Victorian-era undertaker named Austin K. Hoyt (1836-1932). Those in attendance learned about many more characters in Syracuse’s history including philanthropists, playboys, and villains. Greenhagen told of the Cardiff Giant, one of the most famous hoaxes in American history, and its connection to the Westcott curse. After learning of the controversies of Syracuse’s past, the group enjoyed Picasso’s pastries. 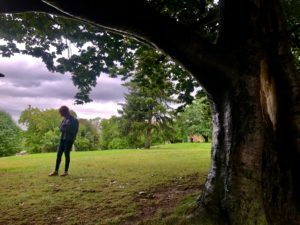 Honors Footnotes are small outings lead by professors to create community within the department.